Villa Skyros is een vrijstaande villa met 3 slaapkamers, een gemeenschappelijk zwembad en internet. De open lounge, patio's en zonnige balkons maken het ideaal voor gezinnen om te ontspannen. Gemakkelijke toegang tot het zwembad, alleen via de tuinpoort, betekent dat u niet ver hoeft te gaan om af te koelen van de glorieuze mediterrane zon hier in Paphos. Met twee gemakswinkels aan de overkant van de weg, hoeft u niet ver te zoeken naar uw benodigdheden. Pambis Diner, ook slechts een paar minuten lopen van het hotel, is een van de meest populaire restaurants in de omgeving met heerlijk eten tegen betaalbare prijzen. Om deze ideale locatie te voltooien, heeft u zelfs geen auto nodig, want de zee ligt op slechts 10 minuten lopen van de villa. Je kunt een wandeling maken naar de haven met zijn vele bars en restaurants, het historische kasteelfort en mozaïeken en natuurlijk de boten. Deze villa wordt ten zeerste aanbevolen. Familie badkamer met bad / douche, toilet, wastafel (eerste verdieping) Badkamer met douche en toilet, wastafel, naast slaapkamer (begane grond). Opmerkingen over accommodatie: Winkels zijn open tot laat in de avond en tot laat in het restaurant voor gasten die laat aankomen. Bij aankomst ontvangt u een welkomstpakket met water, thee, koffie en koekjes. Babymateriaal is verkrijgbaar vanaf 10pw. A / C in de slaapkamers alleen inbegrepen. Wilt u meer accommodatie voor vrienden of familie? Vraag voor meer informatie. Buiten: Verschillende buitenruimten met terrastafels en stoelen en ligbedden. Privérit. Twee zonnige balkons. Patio aan de voorzijde en een aan de achterzijde met directe toegang tot het zwembad. Ommuurd / ommuurd. Bijkeuken: Wasmachine, strijkijzer en strijkplank, kleding airer. Schoonmaak / Handdoeken / Linnen / Schoonmaakservice: Set linnengoed per bed, 2e set beschikbaar voor uw 2e week. Hand- en badhanddoeken per persoon, badlakens, handdoeken. Er is geen schoonmaakservice tijdens uw verblijf, maar er kan een wekelijkse wasservice worden geregeld. My wife and I have just returned to the UK from our 2 week stay at Villa Skyros. We both really enjoyed the facilities that the spacious and well equiped detached villa offered for a wonderful chilled holiday. With large patio areas located to the front, rear & sides of the villa. In addition there are also two large upstairs balconies to the front and rear of the villa, they offer full shade or full sun daylong. The villa has air conditioning units to all three bedrooms, they kept us nice and cool overnight as the weather was unusually hot during our stay for the time of year. There is however no air conditioning to the downstairs living or dining areas, but however there are two large ceiling fans. Skyros is conveniently located across a quiet road from a kiosk shop and a local bar called "The Pambis" this serves good food and drink all day at a reasonable price. We rented a car for the duration of the holiday and parked offroad on the front drive of the villa. You literally walk through the rear gate (that provides safety from the pool for young children) and youre in the pool. we both swam virtually on a daily basis. The pool is very good but the poolside is a little bland and overlooked from two sides by both car parks and holiday apartments. A word of caution for non swimmers there are no depth markings at the poolside! Inside the TV offered access to many UK and american channels and there are numerous DVD'S and books to enjoy. The property managers Dermot and Marilyn were most helpful and informative both prior to and after our arrival. They also kindly allowed us a late departure from the villa on the day of our late departure. I have given the Villa 4 stars but would only rate the pool area as 3 stars as It is not as private as you might be expecting from the photographs. The property as advertised on Owners direct / HomeAway is not as described. The pictures on the HomeAway web site I can only assume must be many years old. The pictures are taken at a clever angle and definitely omit the reality of the Villa. The cleanliness was appalling. We paid a lot of money for the Villa as it looked luxurious on the pictures. We were going to a family wedding in Cyprus. We arrived late at night and were unable to fully view the property we had moved in to, however became instantly aware of the lack of fully working air conditioning units. Downstairs none at all, there was a unit downstairs but it was broken. We tried to use the fans but the humidity was very high and this did not help. It was just blowing 30 degree air around. It became apparent when it was light (in the bedrooms at 6:30am! – no blinds? ), that the property was not as described. We were on a main road, which was noisy through the night with traffic and paper thin curtains, the noise and bright light woke us up at first light, 6.30am. Not funny with a small child! This is supposed to be a holiday! The Air-conditioning was almost useless in the bedrooms, remote controls broken, some with dead batteries and pegs hanging out of the units to keep them from closing the flaps. The swimming pool was out of action and had a notice saying it had been condemned by the government! We also didn’t see any pictures on the website of overlooking apartments and parked cars! What a disappointment. We felt we had no choice but to move out immediately and find alternative accommodation. We had a 5 year old child with us that needed to be kept cool and no way of doing that without fully working air-conditioning or a pool! We would strongly recommend not booking this Villa. We are in the process of acquiring a refund to at least cover the out of pocket expenses in finding immediate, alternative accommodation. Incidentally the visitor’s book in apartment was empty! This house was in exceptional condition and extremely well stocked with everything we needed, from sheets and towels, to kitchen supplies, to the pool, to a wonderful eating area outside. The Farm Market down the street is a solid store for general food shopping (for a wider selection there are big supermarkets in town). There is a bus stop right outside that can take you to the harbor and from there to further destinations. The only complaint is that the Internet was really slow and at times did not work at all. I'm not sure if this is because of the plan used by the house or Internet service in the neighborhood in general - but really this is a minor complaint. Overall it really was one of the best rentals we have ever had - what you see in the pictures is really what you get and more! excellent property, approx 20mins walk to shops and bars, highly recommended. Great villa, superbly finished, couldn't fault anything. Would recommend it to anyone .Suited our party especially having a downstairs bedroom and bathroom my mum has difficulty with stairs so it was ideal for her. We were a party of 6 spending time in this great villa to celebrate my daughter's 40th birthday (she has special needs). 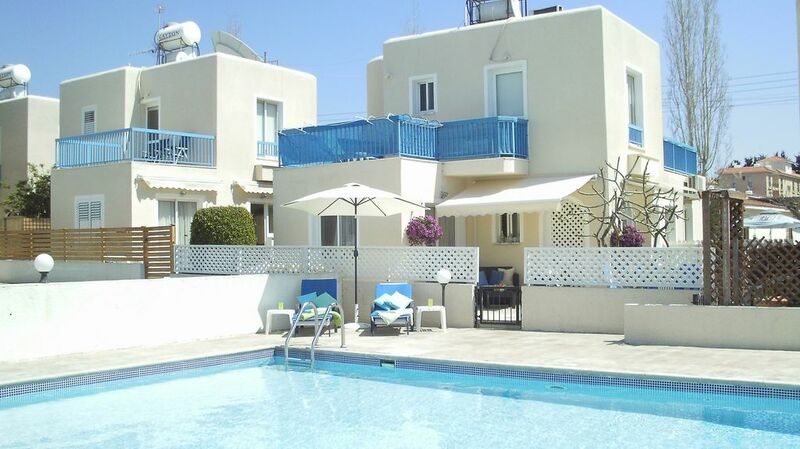 It is an extremely well equipped villa and suited our needs perfectly. Set in a quiet location with two great supermarkets and a fabulous bar/restaurant all within 50 yards walking distance. We hired a small car as most areas like the beach, shops and harbour were within a 10 minute drive and we used to ferry each other about. There is also a bus stop with a bus to the main bus station right outside the villa. Our hosts Marilyn and Dermott were extremely friendly and helpful both with the booking procedure and when we were there. A beautiful birthday cake was in the fridge along with a welcome pack.. There is also adequate outside space for al fresco dining with fences at the back and front giving a modicum of privacy. The pool was kept very clean but the area round it was rather scruffy. I am very happy to recommend this property and the helpful hosts. Paphos biedt jeepsafari-trips naar het Troudos-gebergte en het schiereiland Akamas, ruise-tochten langs de kust van Paphos. Tal van trouwlocaties. Paphos heeft verschillende stranden met blauwe vlag. Het dichtstbijzijnde is ongeveer 10 minuten lopen of slechts een paar minuten rijden van de villa. Hier leidt de wandeling langs de kust naar de mooie haven van Paphos en verder. Naast het complex is een busdienst beschikbaar om u naar de kust te brengen, een reis naar Coral Bay met meer stranden waar u van kunt genieten. Paphos is de dichtstbijzijnde luchthaven op slechts 15 minuten rijden naar de villa. Larnaca is ongeveer 1 uur en 30 minuten rijden. Paphos heeft een overvloed aan historische en culturele bezienswaardigheden om te bezoeken. Informatie vindt u in ons nuttige boek. Een busdienst brengt u naar de markt van Paphos, de haven en de baai van Koraal. Gemakswinkel, boerderijwinkel, Pambis Diner liggen allemaal naast het complex waardoor dit een goede keuze is en populair bij herintreders. Veel winkels en restaurants liggen op slechts enkele minuten van de villa en rondom het gebied van Paphos, met banken en supermarkten een beetje verder. Booking Notes: 25% deposit is required upon booking, with the balance due 8 weeks prior to your arrival. 10pw for wifi. A/C in bedrooms only included. Baby equipment from 10pw. Ask for details. If you need more accommodation for a larger group, ask for details. Wedding groups welcome. Changeover Day: Changeover day is flexible. Arrival after 2pm, departure by 10am. We will always try to accommodate you in the villa until your time of departure, but if the villa is needed for the next guests, then we may require you to vacate at 10am. Daystay closeby Notes on prices: Baby equipment available from 10pw. There is a small charge for wifi of 10pw. A/C included in bedrooms only.